Palmia Observatory: Hooray, we finished with COSPAR (Day 7) and toured SOFIA in Palmdale; Neutron stars; Cosmic ray anisotropy? Hooray, we finished with COSPAR (Day 7) and toured SOFIA in Palmdale; Neutron stars; Cosmic ray anisotropy? Ok, we finally made it through Day 7 at COSPAR and then what would have been day 8 of the conference, Science Nerd and Theatre Impresario, Scott, and I got on a bus tour, put together by COSPAR coordinating committee, and headed to Palmdale, CA for a tour of the airborne observatory, SOFIA. 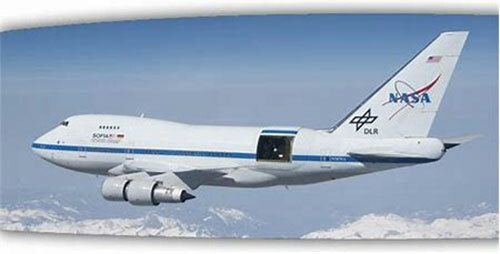 So, before providing a summary of Day 7 of COSPAR, let me first say just a couple of things about our tour of the Stratospheric Observatory for Infrared Astronomy (SOFIA), which is a 1.5 meter telescope mounted in a Boeing 747SP. The aircraft was originally owned and operated by PanAm on its south pacific flights and then bought by United for some of their flights and then mothballed in the desert for a couple of years before NASA bought the airplane and had it retrofitted as a flying observatory. This unique observatory is one of the largest for observing in the infrared region, between 30 - 300 um. SOFIA is built and operated under an 80/20 split between US and Germany. 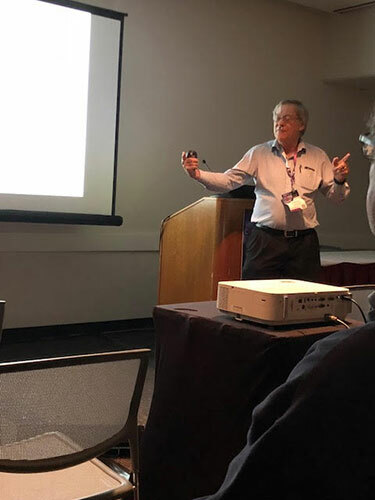 One of the tour leaders was Eric Becklin, now the SOFIA Chief Science Advisor, who I recognized as having received an AAS award at the meeting in DC back in January, for his 54 years working in infrared astronomy. He told us about some of SOFIA's discoveries and shared some stories about them. We really enjoyed getting onboard the aircraft and seeing all of the instrumentation and the telescope, at least on the onside of the pressure bulkhead, with the HAWC+ spectrometer still installed. We were not allowed to take any pictures, although they did promise a group photo to be delivered some time in the future. I sat in one of the aircraft seats and probably did a little bit of daydreaming about what it would be like to be a participant in the science team. Ok, ok, enough of daydreaming about flying around the world making infrared observations, its time to make a few comments about the last day of COSPAR. Oh, by the way, if you missed COSPAR this year, it will be around on its 2-year cycle, but that time it will be in Sydney, Australia in 2020. Hmm, I've never been in Australia, so maybe we should plan to go then. 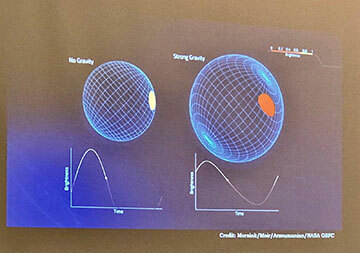 So, a couple of the technical sessions covered what is known about neutron stars, which as it turns out there appears to be a lot of uncertainty about the internal structure of neutron stars. Our common understanding is that they are just a whole bunch of neutrons, but others say they still contain some electrons and protons and perhaps even more exotic particles. Scott and I were wondering how a neutron star supports a high magnetic field, so maybe it is something like that or maybe just the result of a neutron, uncharged it maybe, but it still have a measurable magnetic moment. Anyway, check out the slide below which sort of summarized a couple of dozen current models which estimate internal pressure vs. density. There is sill quite a bit of spread between these various models. 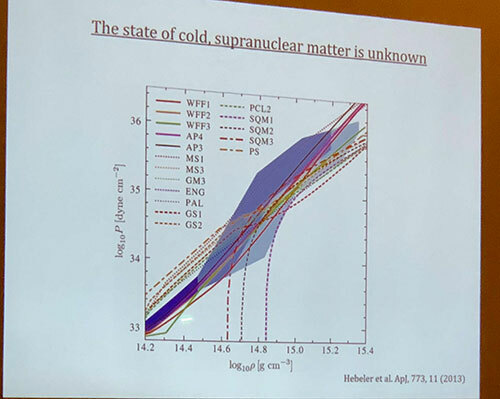 Another presenter, Dr. Slavko Bogdanov, mentioned a complexity that comes about when trying to analyze the hot spot on neutron stars. It turns out that the neuron star's gravity is high enough and can distort space and time that general relativity theory must be used to calculate the size and location of the observed hot spot. On the last day of COSPAR, I went back and attended some of the remaining sessions on cosmic rays. You may recall that in previous posts, I recommended a free internet course on cosmic rays, so I wanted to show again here this screenshot which shows the observed cosmic ray spectrum, which in this case is just the number of observed particles vs. the particle's energy. 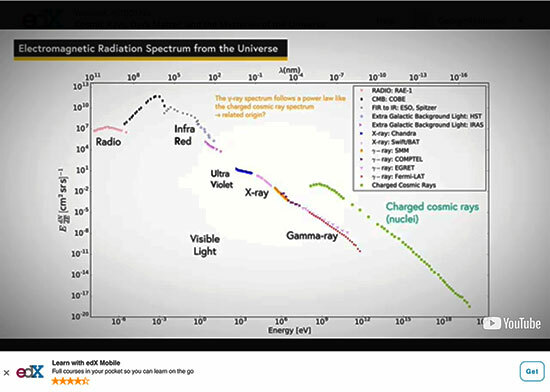 The chart shows the electromagnetic spectrum in addition to the highest particles, which are the cosmic rays. This spectrum is key to understanding the whole topic of cosmic rays in that the sources of the very highest energy cosmic rays is still unknown. Cosmic rays reach Earth and tell us something about the very energetic processes going on somewhere else in the universe. Cosmic rays are becoming another part of multimessenger astronomy, which now already includes adding gravitational waves together with optical observing and now also neutrinos and gamma rays. The problem with cosmic rays is that their path can be distorted by magnetic fields and identifying the source of the rays is more difficult. It is true that light from distant objects can also have its path changed by gravitational bending and lensing, but at least in that case the source of the gravitational field is easier to identify. 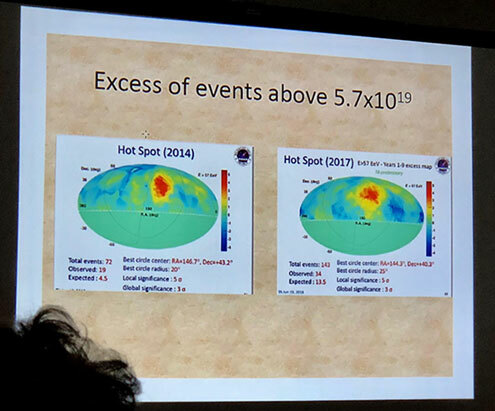 It was quite interesting to hear about the so called cosmic ray anisotropy problem, which is it seems cosmic rays appear to be coming more, outside our own Milky Way, but with some slight preference from a location in which nothing much is observed to be there. The photos taken during two presentations illustrating this issue are shown below. The first image shows the anisotropy measured by the Pierre Auger Observatory. This observatory is located in Argentina and has many ground based sensors spread over about 3000 square kilometers. Some of the anisotropy is due to the motion of the sun in its orbit around the center of the Milky Way, but the rest of the excess is due from some unknown source in the direction indicated. 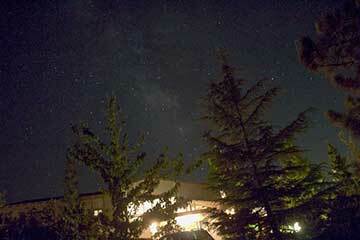 Note the center of the Milky Way, marked with the X, and it is not the source of the very energetic cosmic rays. The second example of anisotropy comes from the Telescope Array located outside Delta, UT, and has many ground based sensors spread over about 1200 square kilometers. So, the main problem is that these very high energy cosmic rays, which ae quite rare and not observed very often, appear to be coming from some obscure spot. The whole issue might also just boil down to being a matter of insufficient data observations and when more observations get made, then maybe the whole effect might just disappear. So, is this cosmic ray anisotropy real or is there some other explanation. 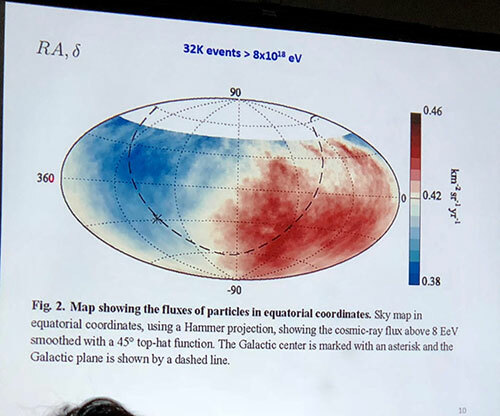 Well, Dr. Vasiliki Pavlidou described how the major unknown is the effect of the galactic magnetic field, which, because the are mostly charged particles, can change the direction of cosmic rays and so the direction from which we observe them coming from may or may not be the direction from which they were initially generated. The galactic magnetic field still remains only imperfectly measured and she said that with the release of the latest Gaia star catalog, it is now possible to measure the magnetic field to much higher accuracy than ever before possible. The technique is to measure the polarization of light, which can be changed by the light passing through a region of magnetic flux. 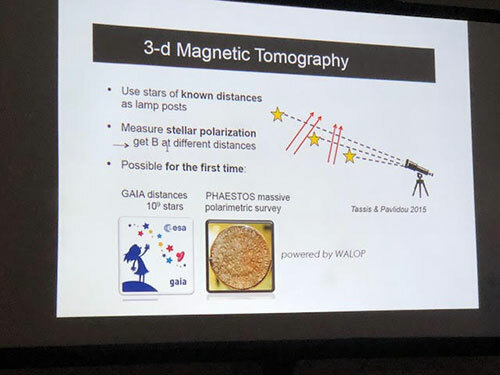 Vasiliki says that knowing the exact location of star and measuring the polarization of light from them that the magnetic effects of intervening dust can be used to make a more precise measurement of the magnetic fields. 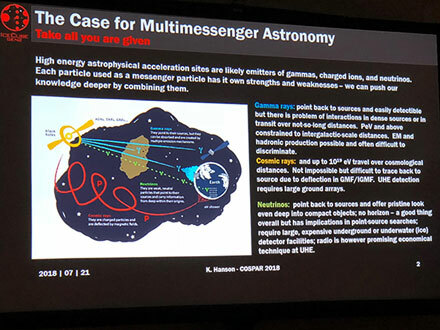 In the same series of cosmic ray discussions, Professor Roger Blandford talked about some comprehensive approaches being considered to explain the full range of energies of observed cosmic rays. It seems that supernova remnants are sufficiently powerful to create some of the cosmic rays, but even they are not powerful enough to create the very largest cosmic rays. So, there must be some other set of processes involved somewhere to boost the cosmic rays to these much higher energy ranges. So the search for the source of the very highest energy cosmic rays goes on and we have to wait and see but maybe it might be resolved when some new observation is made, such as a better measurement of the galactic magnetic field. Although, I hadn't seen Blandford before, I recognized his name. I have one of his textbooks on Modern Classical Physics, which he coauthored with Kip Thorne. Anyway I have the nearly 8 pound behemoth, which I still have not read cover to cover, but thanks for writing a very clear and useful book, Professor Blandford!